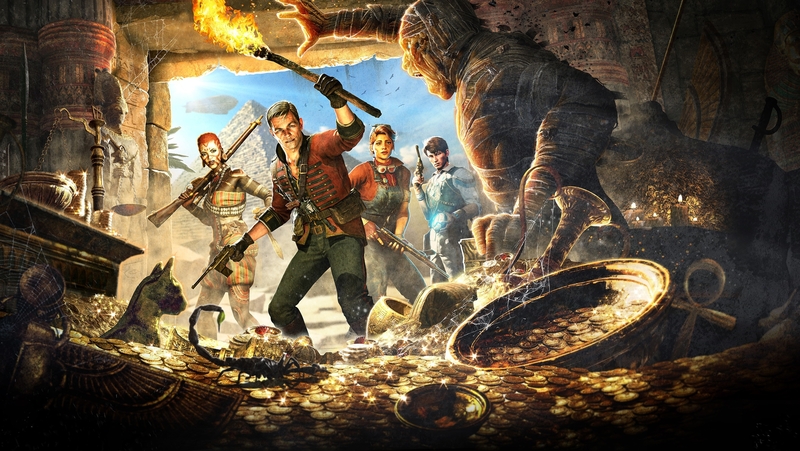 Strange Brigade is a third person shooter with a leaning towards cooperative play. It is set during the 1930’s and has a vibe that is reminiscent of the movies of that era. Bombastic personality and all. The game pits you against several different kinds of mythological enemies as you try to discover all the secrets. While the game is fun to play on your own, it really shines when you play co-op with your friends. Strange Brigade is a fun time and is a breath of fresh air from all the other third person shooters that are out now. Strange Brigade is pretty easy to get into but takes a bit to master. Hitting your mark takes a little practice to get down since there is little aim assist for you to use. Otherwise this game is fairly typical of the genre. The graphics are good enough. Strange Brigade is not going to blow you away by any means but it looks good enough that you won’t really notice either way. Characters are interesting enough to show off their personalities, of which they come with a lot of. Enemies are distinct and interesting as well, adding to the charm of the game and giving you a clue as to what you might be dealing with. Sound design is very well done. Gunshots sound great and have a lot of impact. The voiceovers are wonderfully done and have a ton of personality. Enemies all have unique sound design as well, giving you another cue on what you’re dealing with. As far as games go, this is your typical third-person shooting affair. Although, as I mentioned before, aiming takes some getting used to. Unlike other games of this genre, there isn’t a lot of aiming assist in this game so you have to learn how to be precise. It does make it all the more satisfying to pull off head shots though. The amount of enemies can get a little overwhelming as there can be a lot on the screen at once. Crowd control and using your environment will help out there. I didn’t have any issues in my play through. It’s a pretty solid game. As a 1930’s pulp story, Strange Brigade has you exploring a lot of old ruins and trying to save the world from impending doom. The story is light but the game makes up for it with a lot of personality. There is a small learning curve to the game and it does get pretty challenging, you can easily get surrounded by enemies. Several different kinds of enemies can come at you at once and it’s up to you to figure how to deal with them. You can also use an ability that is unique to each character and is charged up as you defeat enemies. These abilities typically cause damage in the area around your character and are great for crowd control. Using the environment is key to survival though. There are traps that can be set off on the enemy and you can use different areas on the map to give you the advantage (think high ground, etc). Having your friends play with you is also very beneficial. Expect a lot of puzzles and secrets in the environment as well. Strange Brigade has a fairly typical length for this kind of genre. You can play the entire game by yourself but playing with friends could convince you to replay for quite some time. The amount of secrets within in the game also gives you a good reason to go back and find what you missed. Rebellion has been adding new content on a regular basis too and that’s a good incentive to come back. Definitely worth the full price. Have a friend get a copy too. Strange Brigade is a fun addition to the third person shooter genre. It has a style that really makes it stand out with lots of content and secrets to explore. While it can be played on your own, it really shines with the co-op feature. The shooting mechanics take a bit to get used to but that is mostly because it doesn’t assist your aim as much as other games do. Otherwise expect lots of charm and personality, something that is a very nice change from other similar games.